Snow is scarce, reservoirs are approaching bottom, and groundwater is being exhausted in the nation’s most populous state. More than a dozen communities face water shortages in the next 60 to 100 days, and there will be zero water deliveries from the state’s largest canal system this year. This graph shows cumulative groundwater losses (measured in cubic kilometers and million acre-feet) in California’s Central Valley since 1962. The red line shows data from the U.S. Geological Survey’s calibrated groundwater model simulations from 1962-2003. The green line shows satellite-based estimates of groundwater storage losses produced by the UCCHM at UC Irvine. Background colors represent periods of drought (white), of variable to dry conditions (gray), of variable to wet conditions (light blue) and wet conditions (dark blue). Groundwater depletion mostly occurs during drought, and progressive droughts are lowering groundwater storage to unsustainable levels. Click image to enlarge. Trapped in a dry phase among the worst in the last 500 years, California is losing water reserves as if through a sieve, according to satellite data released Monday. The data also show that groundwater, a common safety net in times of drought, is being guzzled unsustainably in the state’s prime farming region, the Central Valley. Recognizing the perilous situation, the California Department of Water Resources cut anticipated water deliveries on January 31 from the state’s largest canal system to zero for the first time in the project’s 54-year history. The announcement affects thousands of farmers, as well as 24 municipal contractors. The department also requested a reduction in the amount of water that it releases through the Sacramento-San Joaquin Delta, an ecologically fragile area. Some towns are already on the brink — last week, the California Department of Public Health announced that 17 communities, ranging in size from 39 to 11,000 people, face water shortages in the next 60 to 100 days. From when the current drought began in November 2011 through November 2013, the amount of water stored in the Sacramento-San Joaquin watershed, the state’s largest, and in the Central Valley has dropped by 20 billion cubic meters (5.3 trillion gallons), or two-thirds the volume of Lake Mead, the nation’s largest reservoir. The recent losses are in addition to the 30 billion cubic meters (7.9 trillion gallons) of water that the state lost from 2003 to 2010 – a volume equal to Lake Mead. Both figures come from analysis of GRACE data by researchers at the UC Center for Hydrologic Modeling at the University of California, Irvine. GRACE is a pair of NASA satellites, launched in 2002, that use changes in the Earth’s gravity to monitor fluctuations in total water storage; that is, the amount held in reservoirs, mountain snowpack, soils, and aquifers. To put this in perspective, 50 billion cubic meters (13.2 trillion gallons) lost in this region between 2003 and 2013 is more than the entire state’s total annual water withdrawals in 2005 — and almost half of that was lost over the last two years alone. In other words, leading up to November 2013, the diminishment in California’s water reserves represent the worst two-year decline in that state in the 10-year GRACE record. But water supply conditions in the most populous U.S. state are even more dire than these data suggest. Thanks to an unrelenting ridge of coastal high pressure that blocked storms from the Gulf of Alaska, California’s drought deepened in the two months since November 2013 — almost no rain or snow has fallen in the state during its wet season, and snowpack is just 15 percent of normal, meaning that there is little snow in the mountains to replenish depleted reservoirs during the spring melt. From a birds-eye view, however, scientists do not know exactly how much worse the drought has become. GRACE data for December 2013 and January 2014 are not yet available for analysis due to the time required to process the raw numbers, and the next update will not be available until early summer. 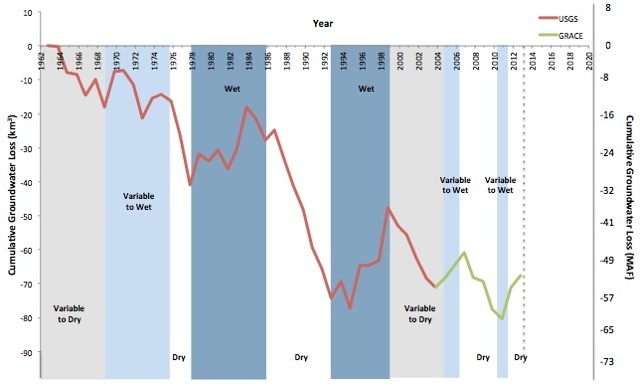 Historically, California gets through two consecutive dry years by drawing down its reservoirs, according to Jay Lund, director of the Center for Watershed Science at the University of California, Davis. After two drought years, Lund told Circle of Blue, groundwater becomes an essential source. State data bear this out. Key reservoirs that feed major canal systems are currently at or near record lows for this time of year. Near Sacramento, for instance, towns and mining roads that were inundated when Folsom Lake was created in 1955 are now above the water line, as the reservoir has recently dropped to 17 percent of capacity. Meanwhile, Stanislaus County in the Central Valley approved twice as many new wells last year as in recent years, the Modesto Bee reported. Modeling done by the U.S. Geological Survey shows groundwater levels dropping sharply in drought years. Researchers at the UC Center for Hydrologic Modeling used those data to demonstrate that the aquifers in the state’s agricultural heart are being used unsustainably. Numbers from the GRACE satellites and the U.S. Geological Survey reveal a steady downward trend in the amount of water that is held in Central Valley aquifers. The aquifers are used primarily to irrigate the valley’s 1.5 million hectares (3.7 million acres) of farmland, which is half of the state’s total. Even though they are polluted with nitrates, the aquifers also are a water source for many small, impoverished towns. The aquifers’ decline reflects a longstanding and problematic imbalance in groundwater use — more water is pumped out during the dry years than soaks in during the wet years. In other words, the bank account is steadily being drawn down. A USGS study, published in November, argued that land subsidence threatens the structural safety of the Delta-Mendota canal, a major cog. Pumping from below, in other words, may cause the system to crack from above. State neglect of groundwater is not an oversight – it is inherent to the system. California has no statewide policy on groundwater use, said Doug Parker, director of the California Institute for Water Resources. No reporting requirements; no permits to regulate the amount of water withdrawn. Famiglietti told Circle of Blue that the state needs policies that put a brake on groundwater use.